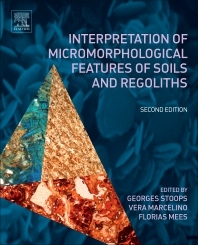 Interpretation of Micromorphological Features of Soils and Regoliths, Second Edition, provides researchers and students with a tool for interpreting features observed in soil thin sections and through submicroscopic studies. After an introduction and general overview, micromorphological aspects of regoliths (e.g., saprolites, transported materials) are highlighted, followed by a systematic and coherent discussion of the micromorphological expression of various pedogenic processes. The book is written by an international team of experts in the field, using a uniform set of concepts and terminology, making it a valuable interdisciplinary reference work. The following topics are treated: freeze-thaw features, redoximorphic features, calcareous and gypsiferous formations, textural features, spodic and oxic horizons, volcanic materials, organic matter, surface horizons, laterites, surface crusts, salt minerals, biogenic and pedogenic siliceous materials, other authigenic silicates, phosphates, sulphidic and sulphuric materials, and features related to faunal activity. The last chapters address anthropogenic features,archaeological materials and palaeosoils. Georges Stoops contributed substantially to the understanding of the genesis of arid and tropical soils, and to the development of concepts and terminology for the description of soil thin sections. His outstanding research activities in an international context, contributed considerably to the development of soil micromorphology, while his enthusiastic teaching in Ghent and elsewhere promoted the use of soil micromorphology worldwide. His achievements have been honoured for instance by the Kubiëna Medal of the International Soil Science Society (1992) and the Philippe Duchaufour Medal of the European Geosciences Union (2010)..
Dr. Marcelino has many years of research experience in soil micromorphology, especially in the field of tropical soil development, and was guest lecturer at several Intensive Training Courses on Micromorphology organised in various European countries. Dr. Mees has many years of research experience in sediment petrology, soil mineralogy and micromorphology, applied to sediments and soils in arid and semi-arid environments, and later mainly in humid tropical environments, especially in Central Africa. Based on the widely accepted terminology of Stoops (2003), this book is currently the lead textbook on soil micromorphology. The 'General Guidelines and Keys' which are presented in Chapter 2 of the first edition are found to be most useful. Adding a detailed glossary, including the Latin etymology for all technical terms, could greatly improve this book. The second edition of this book will soon be published - this is certainly something to look forward to. As a reader, it is my hope and believe that the second edition will include new developments, insights, and methods in the field of soil micromorphology.